Soo Finnish Nordic Ski Club members are invited to participate in one or more of the ski technique lessons that are offered free of charge. Whether you are new to skiing or want to improve with some technique tips, all are welcome! Non-members are welcome for a fee or by becoming a member. Our instructors have many years of experieince behind them. Each is a long-time skier and member of Soo Finnish Nordic Ski Club. We take great pleasure in teaching adults to learn the basics, to improve, or to introduce them to skating. It is very gratifying to see skiers graduate from walking on skis to gliding, or from insecurity to confidence on hills. We’re volunteers. We love to ski and want to pass it on! 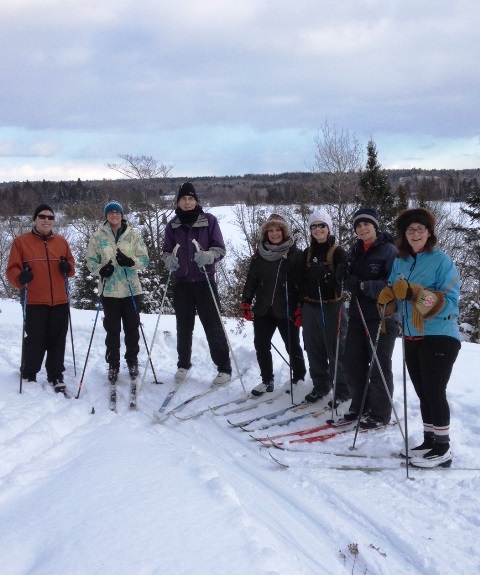 Please contact us at contactus@soofinnishnordic.com if you would like more information or are interested in adult cross country ski lessons. The Saturday morning series of lessons are offered free to SFN members. If a non-member wishes to join the Saturday lessons, they may do so by paying a fee per lesson ($10 for a group lesson). These fees go directly to SFN for it’s programs. Should you wish to arrange a private, semi-private or group lesson at any time other than the Saturday lesson series, you may do so by request through the email link re: adult lessons. This will be arranged and you will be contacted by email or phone to set it up. You may request a particular instructor if you wish. Private- $30 per hour, Semi-private – $20 per hour, Group – $10 per hour. These fees are payable directly to the instructor.